Artillery plant, photographed at Green Cay Natural Area in Boynton Beach, Palm Beach County. 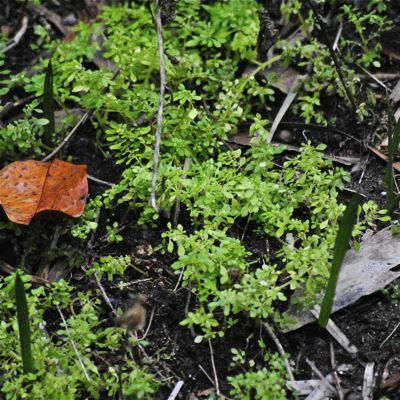 One person's weed is another's house plant or ground cover. We've seen artillery plant mostly as a pest, a weed growing in pavement cracks, an unwanted presence in flower beds. But some people find Pilea microphylla, as it's known in the scientific world, attractive enough to use as an ornamental. 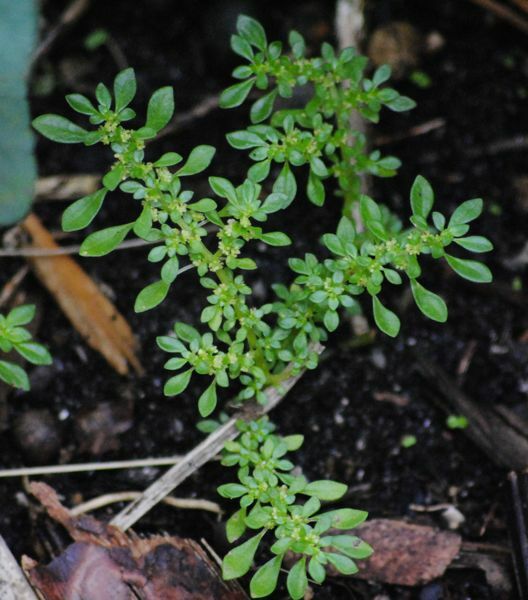 It is a Florida native found in hammocks, disturbed areas like roadsides, in rocky woods, in gardens and in masonry. Yes, masonry. It's found throughout South Florida, the one exception, according to the U.S. Department of Agriculture, being Palm Beach County, where we've seen it most frequently. Like in our yard. Within the United States, it's native throughout the Southeast as far north as Tennessee and Kentucky. It's been found in Michigan, although there are doubts that the plant is able to persist even in Tennessee let alone Michigan. Artillery plant is also found in parts of the Caribbean, Mexico, Central America and South America. It's become naturalized in parts of Asia, including Pakistan and China, and the Pacific, including Hawaii. As far as we can tell, it's not considered an invasive anywhere it's found. Artillery plant's flowers are tiny, measured in fractions of millimeters but they do have one characteristic that gives the plant its name. Male flowers distribute pollen literally by "shooting" it as far as 18 inches. It is a short-term perennial in South Florida, an annual in the northern part of its range. It can reach 12 inches tall and spread as much as 24 inches across. We've usually seen it shorter, however. It will grow in full sun and in shade but prefers a mix of both. The odd thing to us is that artillery plant is cultivated for use both as a ground cover and as a house plant. It's not hard to find instructions on where to find and how to grow this plant. Artillery plant apparently is edible, though we don't recommend it. The ASPCA has it on its list of nontoxic plants if that's any reassurance. It also has been used medicinally in Cuba. Some scientific testing of the compounds found in the plant show antibacterial and antioxidant potential. In Trinidad and Tobago, it's used for child birth and infertility. In China, it's been used to treat fluid retention, in Jamaica, asthma; in Barbados, bowel disorders. Believe it or not, artillery plant is a member of Urticaceae, or the nettles family. Other common names: artillery fern, gunpowder plant, pistol plant, lace plant and rockweed.